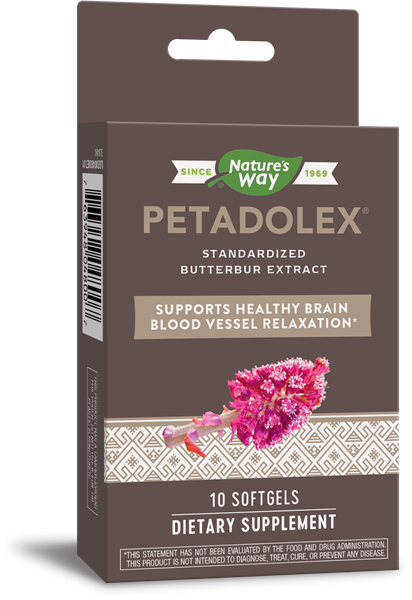 Petadolex® ASAP / 10 softgels - Nature's Way®. • Uses a patented extraction method, ensuring valuable petasites compounds are captured. • Also ensures that toxic levels of inherent compounds, such as pyrrolizidine alkaloids (PAs), are left out. • Is tested for pyrrolizidine alkaloids, made possible by using this patented process (U.S. Patent #6,551,626). • Butterbur extract contains two compounds, petasin and isopetasin, with bioactive properties. • Convenient 10 softgels size is perfect for on the go. Caution: Discontinue use and consult a healthcare professional if you have a liver disorder or develop symptoms of liver trouble, such as abdominal pain, dark urine, or jaundice. If pregnant, nursing, or taking any medications, consult a healthcare professional before use. Petadolex® is distributed by Nature's Way® under license from Weber & Weber.